It's been a while since I have picked up a classic novel. I know of Daniel Defoe, but never really got to read any of his works, until now. 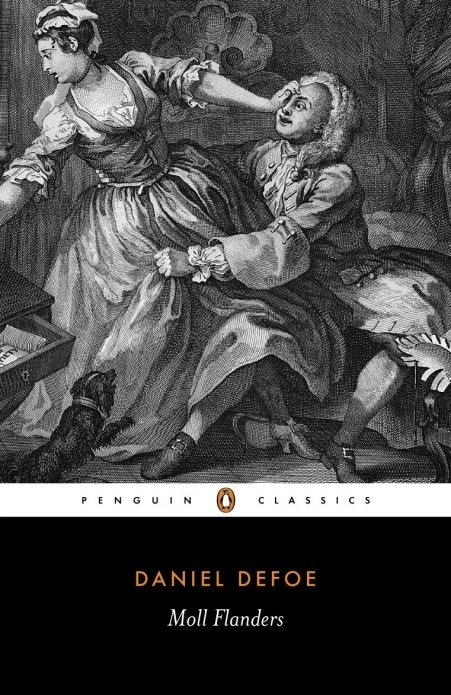 I never realized that he lived in a period far far removed from the present, and so upon reading Moll Flanders, I learned more about the differing viewpoints and perspective of people from the 17th century. For example, I learned how being transported to the colonies is a punishment. Nowadays going from England to Virginia isn't a bad thing (although now that Trump is president that's probably not true), in 1722 sailing from Europe to the Americas is a punishment. People typically go there because they are convicted of a crime, and they aren't wanted in England anymore. I also learned that the justice system back then is horrible. I mean, wow, just because you committed burglary, then you will be sentenced to death. People were hanged there quite often. And never underestimate the power of the mob. People somehow want a juicy gossip, and every time there is something interesting happening, they will congregate and watch. And if the crowd thinks you're evil, then they will do everything to disgrace you. Anyway, these are just some of the themes that are handled in this novel. It is a picaresque novel, written autobiographically, with the eponymous heroine (or is it anti-hero?) narrating the events. We follow Moll's life, from the time she was born in prison, to her slow rise in society. She gets married, multiple times, and then turns to a life of crime, and somehow, the stars align all the time, and she emerges safe and sound, and fortunate. That's probably the aspect I didn't like the most. I mean, how believable is that? She seems to escape every event unscathed, unharmed, and even when she finally gets arrested, and sentenced to death, she somehow was able to manipulate things into her favor so that she gets transported to the Americas instead, and not as a prisoner! I just find it too fantastic, and unbelievable. I wanted to see this novel as a reflection of society back then, at how people need to do everything they can to survive. Sure, back then, people get married not because they love each other, but because they think marrying the other party will bring them more revenue. Yes, people back then (and even now) get married because of inheritance, and other financial reasons. So yes, at some level, this is a novel of survival. Except that our heroine seems to survive every time, to the point that the reader starts to think that she might be a superhero. After all, the novel ends when she is almost 70 years old, yet the life expectancy in England back during the 17th century was around 35. And as far as I understand, our hero isn't an aristocrat or member of the nobility, but a common person, who just happens to have her stars align all the time. So that was somehow disappointing, in the sense that I had a hard time suspending my disbelief. I also found it hard to relate. I mean, she is technically an anti-hero, but I didn't find myself rooting for her. In the end, I read the novel not for its narrative content, but for the history. It was an interesting read, but it felt like it was assigned to me. I didn't find myself enjoying the prose the same way as I would devour Paul Bowles or Jose Saramago, for example. Anyway, I finished it. I'm giving it 3 stars. Read it if you're into historical stuff.